Twelve corporations pay effective tax rate of negative 1.5% on $171 billion in profits; reap $62.4 billion in tax subsidies, and as a group, their federal income taxes were negative: –$2.5 billion, according to Citizen Tax Justice (CTJ) in their latest study. The advocacy group included famous names in the list: Boeing, Dupont, Exxon Mobil, FedEx, General Electric, IBM, Verizon Communications, Wells Fargo, Yahoo, American Electric Power, Honeywell International, and United Technologies. All but two of the dozen companies enjoyed at least one no-tax year over the 2008-10 period, despite reporting substantial pretax U.S. profits in those no-tax years. 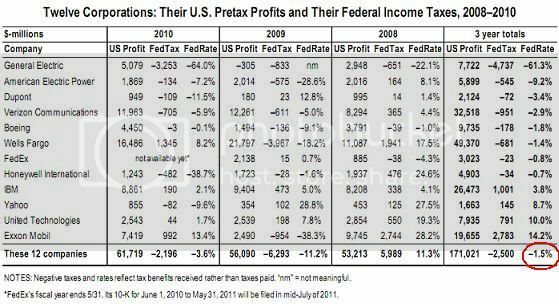 Over the 2008-10 period, GE enjoyed $4.7 billion in tax benefits on top of its $7.7 billion in pretax U.S. profits. Not a single one of the companies paid anything close to the 35 percent statutory tax rate. Exxon Mobil, paid an effective three-year tax rate of only 14.2 percent. That’s 60 percent below the 35 percent rate that companies are supposed to pay. And over the past two years, Exxon Mobil’s net tax on its $9.9 billion in U.S. pretax profits was a minuscule $39 million, an effective tax rate of only 0.4 percent. CTJ also noted that President Obama has indicated that he wants to eliminate corporate tax subsidies, but use all the increased revenue to lower the statutory corporate tax rate, instead. Lobbyists for big business in opposite of the so-called “revenue-neutral” approach, and call for changes that would reduce corporate tax payments by trillions of dollars over the upcoming decade. The report is just minor part of its forthcoming major study of Fortune 500 companies and the taxes they paid (or failed to pay) over the 2008-2010 period.